This is, according to the counter to my right, my 400th STARLOGGED post of 2013 so I've been holding this - the first part of my next MARVEL UK Cover Gallery - back to coincide with that magic number. It remains to be seen whether I can muster another 113 posts to beat last year's final figure of 513. 400 posts. FANTASTIC FOUR. You can (kinda) see what I've done here. I hope. This 1982-83 weekly clocked-up an unimpressive 29 issues before being merged with SPIDER-MAN's weekly, supposedly to make way for the new THOR and X-MEN books. 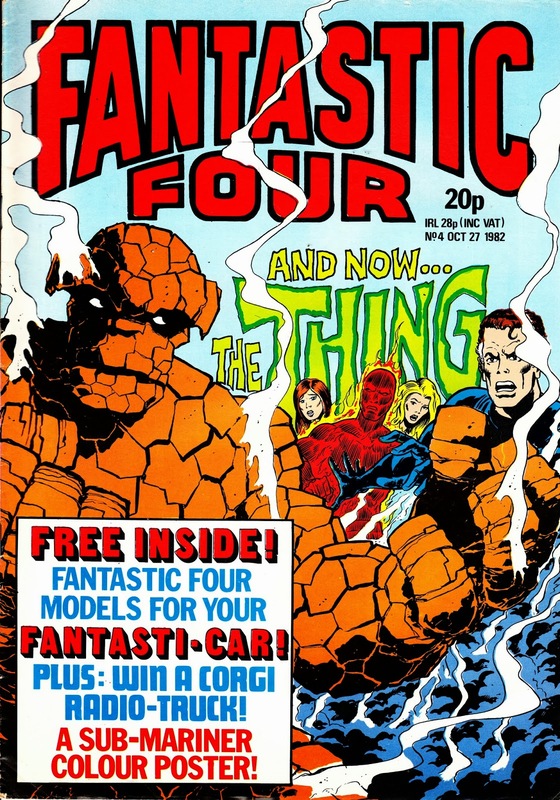 The FF had been a British fixture right back to 1972 and the first issue of THE MIGHTY WORLD OF MARVEL (and actually back into pre-history thanks to the sixties Power Comics reprints of the same material) but this was Marvel's third crack at making their first family stick as a standalone title in the UK. 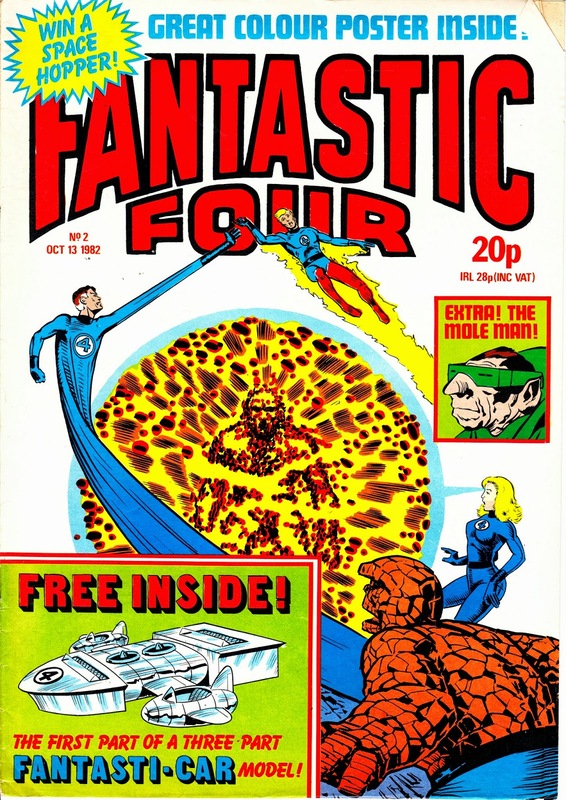 THE COMPLETE FANTASTIC FOUR ran for 37 issues between 1977-78 before merging back into THE MIGHTY WORLD OF MARVEL, possibly because its cover-to-cover reprints were devouring material too fast to make it sustainable. The foursome were back in 1980 as part of the POCKET BOOKS range. With Dez Skinn long gone, the digest-sized line ran out of steam in 1982 but I assume the sales figures on THE FABULOUS FANTASTIC FOUR led directly to the launch of this weekly replacement. The format followed the post-November 1981formula of 24-pages with glossy covers and centre-spreads with black & white interiors. This earns it a little footnote in the history of the Annex of Ideas: the last new launch to have (centre-spread not withstanding) purely b&w interiors. THE MIGHTY THOR would, after a (very) shaky start usher in a new era of colour interiors. The reprints covered roughly the same timeframe as the FF's last weekly, kicking-off with a rerun of The Monster in the Streets from US FF 105, cover-dated December 1970. - Their Hero History, right through to the Panini era, can be found here. 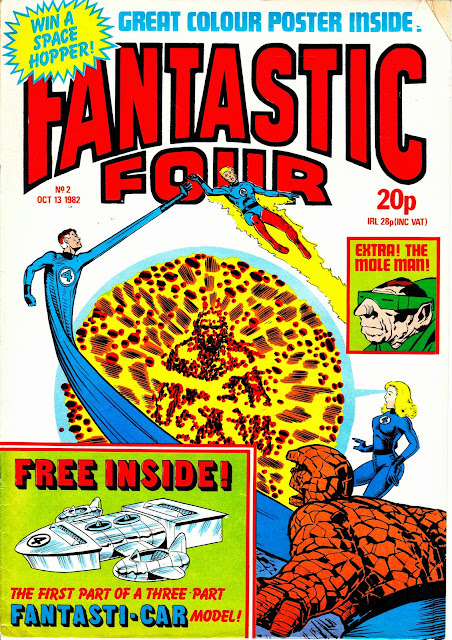 - A Cover Gallery for THE COMPLETE FANTASTIC FOUR can be found here and here. - An overview of the POCKET BOOKS line can be found here. - The short-lived MARVEL ACTION HOUR TV spin-off, including the FF, is here. - Ben Grimm's short-lived solo book, THE THING IS BIG BEN, is here. - The colour-me-in FANTASTIC FOUR ALBUM is here. - The FF run in MARVEL TEAM UP is here. - Their brief stint in MARVEL ACTION is covered here. Complete FF (the FF's first weekly) clocked up just 37 issues, not 53. Loved this incarnation of FF Weekly. 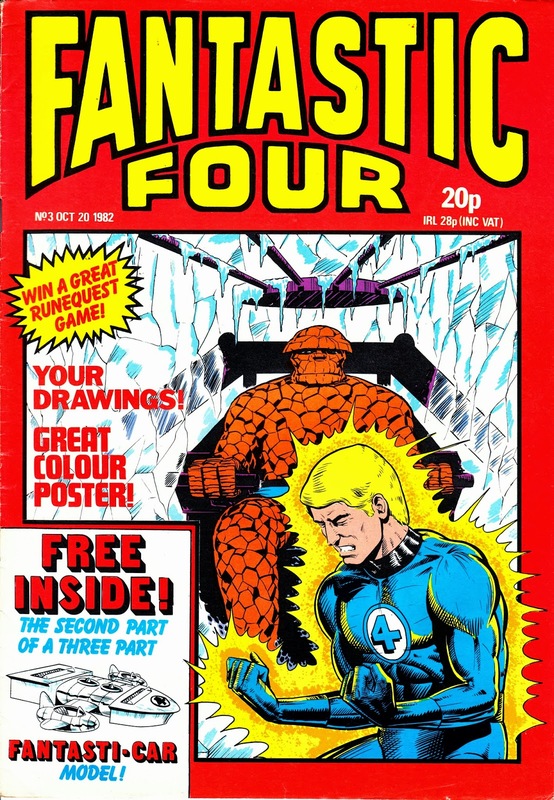 It covered that great run of post-Kirby stories, but more importantly featured the best free gift ever - a four-part, build-your-own Fantasticar! And yes, I still have mine (though the glue's rather drying out thanks to the FF's unlikely enemy - Central Heating!). My other memory of this weekly was the poll to decide which character should appear as back-up strip. One offered candidate was Ghost Rider, can't remember the other - possibly the X-Men? - but I do recall that neither appeared - instead we got Iron Man, which seemed like a cheat after all the hoopla to vote. The addition of a back-up strip felt like the start of the end and before long excuses were found to chop the FF strips into smaller and smaller chunks before it merged with Spider-Man Weekly. Thanks for the quick warning about my wayward issue count on THE COMPLETE FF. That's now fixed (so it looks like I had it right all along - hehe!). This collection I have has long since parted company with the Fantasticar. Could you send photos that I could post here? I'll combine them with the instruction sheets contained in the issues and make an 'event' of it. There were a number of back-ups that popped-up later which I was going to mention in future posts: SPIDER-MAN and DOCTOR STRANGE spring instantly to mind. I suppose its possible that Marvel were worried (ha!) 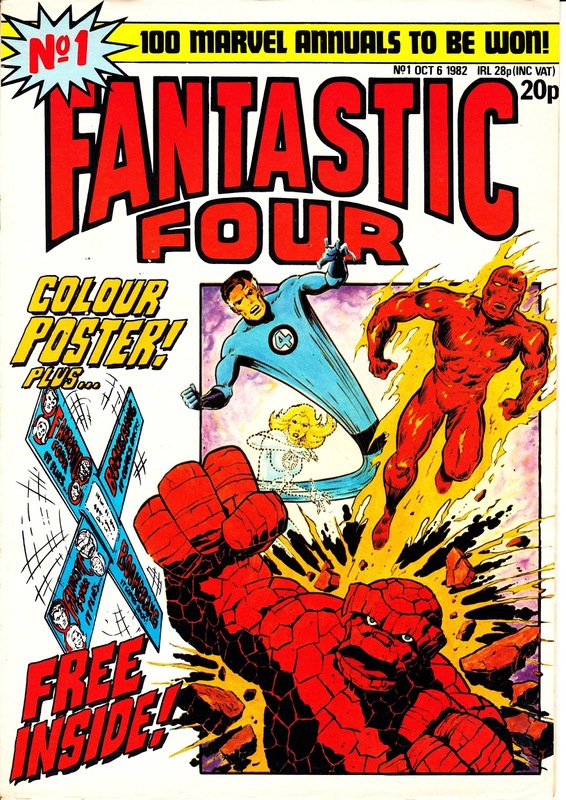 that the same scenario of exhausting the back-catalogue might curse this incarnation of the FF as well (one week = one US month) although they did have 12 years of material to work through first. Alternatively, they either felt other strips would boost sales OR they were testing potential new launches (but the strips they selected doesn't seem to make that likely). I'll get my Fantasticar out of storage (AKA my parents' spare room) and snap a picture for you as soon as I can.